Established in 2002, Autosaver started out as a general car service and repair workshop. Due to intense competition and dynamism of the automotive industry, mindset changes were essential to bring about a new workshop image for the future. Auto Saver did exactly all these and emerge a success with unanimous support from the NISSAN and TOYOTA motor clubs in Singapore. In 2007, Auto Saver became the only independent operator to franchise its workshop model in Bangladesh, its first international franchisee. Following that, Auto Saver was selected as a finalist in the Promising Franchisor award in 2007. Riding on the renewed interest in the industry, Auto Saver embarks on its direction to grow regionally and globally. To be a leading automotive service provider in the region. 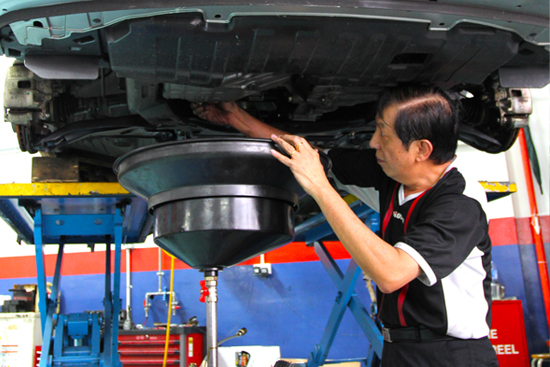 Auto Saver has an extensive network of franchisee outlets and branches throughout Singapore and with an ever increasing lineup of quality products that are recognized by countless motorists, fleet managers and industrial administrators as one of the best and most cost-effective choice for increasing engine performance, reducing maintenance and prolonging vehicle and equipment life. It’s no wonder hundreds of motorists are already flocking to Auto Saver outlets islandwide when it comes to servicing their cars because of the excellent service and professionalism! Auto Saver has been long renowned as an excellent alternative place to service your car especially for Toyota, Nissan and Honda owners. By strictly following guidelines according to the car owner’s manual, Auto Saver carries out periodical maintenance service on your car, protecting its warranty at the same time. Drivers will also get to enjoy a transparent pricing system, standard procedures and friendly technicians whom will deliver Auto Saver’s promise of a Peace of Mind. In addition, the value packages and innovative products available at each outlet of Auto Saver will cater to the most discerning of drivers. Whether you have purchased a new or pre-owned car, Auto Saver is committed to making sure your car delivers more years of driving pleasure and reliability. Established in 2002 as a simple car service and repair workshop. From the beginning, Bobby Ong, the Managing Director, saw the need to set Auto Saver apart from competitors and create a brand to fill a gap in the auto maintenance industry. Autosaver has accomplished this objective by successfully providing quality service according to a car owner’s manual using 100% genuine parts for over 8 years. By offering transparent pricing structure and implementing systematic training methods to train their mechanics, Auto Saver’s honest and transparent way of providing car maintenance service has shown results in raising the image of the industry progressively. They have also built a loyal customer base in Singapore and in 2007 made the decision to offer their brand of car maintenance business as a franchised package for interested business partners who wish to introduce Auto Saver to their own countries. Today, Auto Saver has a growing group of franchisees in Asia. Auto Saver operates its business in a two-fold nature. Firstly, their main business is providing professional car maintenance service according to a car owner’s manual using 100% genuine parts. Servicing mainly Japanese car brands and offering car-grooming services to a wider range of cars. The auto parts division and its import and distribution activities also allow Auto Saver to pass on savings to their customers. Secondly, Autosaver ’s role as a franchisor continues to grow with franchisees branching out to Malaysia, Bangladesh, Indonesia, Thailand, Samoa and Tonga. With a growing number of potential franchisees, both locally and internationally, Auto Saver is also investing in Research and Development efforts to create new innovative products and service packages that will boost their car maintenance, auto parts and car care businesses across the network of Autosaver outlets locally and overseas. With their customers always on the top of their list, Auto Saver Ptd Ltd, the company, and Auto Saver, the Brand, is one and the same. Therefore the organisational history, the nature of business and product and services offered apply to the company and the brand as well. Auto Saver’s service tagline “Service By the Book. Follow Your Owner’s Manual” indicated on the red banner under the logo reinforces their unique value they bring to customers via service standards and procedures, according to the car owner’s manual of course. In addition, Auto Saver provides additional peace of mind to customers by using genuine parts for all preventive maintenance. Auto Saver offers auto maintenance packages for Japanese and Korean car brands such as, Honda, Toyota, Nissan, Hyundai and Kia according to their current mileage count. They also offer optional preventative maintenance packages for customers who are looking for an added service to their cars. Auto Saver launched a car care division in 2006 and has since developed a range of in-house car care products, such as, Paint Saver, Sound Saver and Rim Saver to meet their customers’ needs. So if you’re looking for a reliable and professional workshop for total peace of mind insist on Auto Saver!